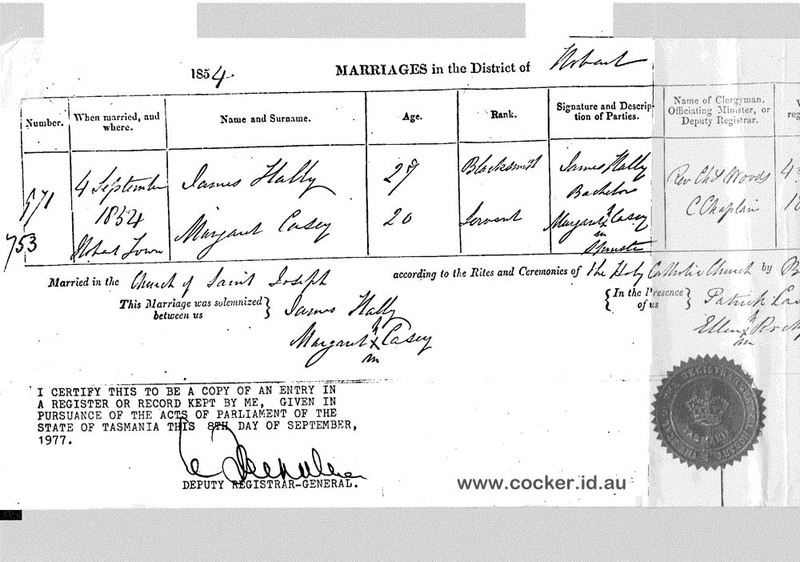 It is likely James and Margaret moved to Pontville soon after their marriage. On 23 January 1855, four months after the wedding, James was recommended for a Conditional Pardon. Later that year, he was charged with two offences, the only ones to appear on his record. On 12 July, he was fined 20 shillings “for being drunk” at Richmond. As Richmond was the name not only for a town but also for a district which stretched as far west as the Jordan River, it may be that James was already living in Pontville by July 1855. On 9 November, he was fined 5 shillings for “disturbing the peace” in Pontville. Given the relative leniency of this second fine, perhaps he was celebrating the arrival of his first child, Mary, who was born some time in 1855. The birth was registered in the district of Brighton, which included Pontville. Whatever the cause of James’ outbursts, he must have remained responsible in the eyes of the authorities, as he received his Conditional Pardon on New Year’s Day 1856. James appears on the Brighton Electoral Roll for the first election for the new Parliament of 1856. The Roll had presumably been drawn up early in the year. He is shown as a householder of Pontville, with William Lythgo as his landlord. There seems no doubt they were there by 21 April 1856, the day they acted as witnesses at the wedding of John Aylward, 38, widower, and Eleanor Bass, 26, spinster, at St Marks, the Church of England place of worship high on the northern bank of the River Jordan at Pontville. So, the Hally connection with Pontville had begun. James either worked for another blacksmith for some time or set up his own business immediately. James and Margaret were to remain as residents of the village until their deaths, 47 and 51 years later respectively.